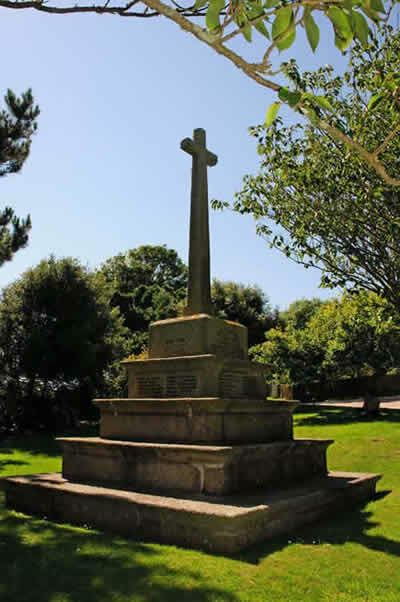 Thurlestone War Memorial is sited on a pretty green space in the very heart of the village The cross was modelled on the old village cross at South Zeal . Lt. Gerald K. Clifford of the 13th Battalion (the Kensington Battalion), the London Regiment. Son of Alfred and Helen Clifford. Born in Staines, Middlesex in 1895. Died 1 July 1918 aged 23. Buried in All Saints Churchyard. Captain Wilfred Bertram Creswick of the 4th Battalion, the King's Own Yorkshiure Light Infantry; attached to the 179th Field Coy, the Royal Engineers. Son of Wilfred and Margaret Creswick. Born in Sandal, Yorkshire 27 June 1886. Died 10 April 1916 aged 30. 10615 Private Albert Bowsher Dyer of the 6th Battalion, the Devonshire Regiment. Son of John and Julia Dyer of the Coastguard Station, Thurlestone. Born in Bantham in 1893. Died 2 November 1915 aged 22. Buried in All Saints Churchyard. 293013 Stoker Petty Officer William Dyer of the Royal Navy, HMS Black Prince. Son of Abraham and Susannah Dyer; husband of Elizabeth Dyer. Born in Paignton 1 January 1885. Died in the Battle of Jutland 31 May 1916 aged 31. 20618 Private James Whiting Elliott of the 1st/4th Battalion, the Devonshire Regiment. Son of Joseph and the late Susannah; husband of Elizabeth Dyer. Born in Thurlestone in 1882. Died 23 January 1919 aged 37. 42132 Private Harold John Henry Ellis of the 17th Battalion the Manchester Regiment. Son of John and Elizabeth Ellis. Born in Thurlestone in 1896. Died 22 March 1918 aged 22. 10/1266 Private Geoffrey Arthur Ilbert of the 1st Battalion, the New Zealand Expeditionary Force. Son of Peregrine Edward Ilbert of Auckland, New Zealand (Grandson of a former Rector of Thurlestone. Born in Tonbridge, Kent 5 June 1883. Died 28 February 1917 aged 33. 15164 Private John William Inchbald of "C" Coy, the 10th Battalion, the Yorkshire Regiment. Son of David and Annie Inchbald of Scarborough; husband of Gertrude Inchbald also of Scarborough. Born in Scarborough in 1880. Died 22 April 1917 aged 37. Served in the South African Campaign. 44279 Private Arthur Owen of the 2nd/4th Battalion, the Royal Berkshire Regiment; formerly 45826 of the Hampshire Regiment. Son of Nathaniel and Emma Moore. Born in Thurlestone in 1899. Died 11 August 1918 aged 19. 191741 Able Seaman John Thomas Moore of the Royal Navy, HMS Avon. Husband of Alice Moore of High Street, Stonehouse. Born in Thurlestone 16 September 1881. Died of illness 8 April 1916 aged 35. 25817 Private (Samuel) George Pope of the 7th Battalion, the Somerset Light Infantry; formerly 25817 of the Devonshire Regiment. Son of Bessie and the late Robert Pope. Born in Thurlestone in 1888. Died 13 December 1916 aged 28. 288222 Petty Officer Stoker William Wood of the Royal Naval Reserve, serving on HMS Goliath. Husband of Mary Wood of Thusleatone. Born in Kingsbridge 31 May 1877. Died 13 May 1915 when his ship was lost aged 38.